Delicate touches make a monitor truly great. VS229NA Full HD LED monitor, embedded the wide-viewing-angle panel with 80,000,000:1 high contrast ratio is optimized for the finest image and color quality. This approach extends to the sturdy stand and slim profile without compromising style in ensuring stability and durability. VS229NA adopts 178˚(H) / 178˚(V) ultra wide viewing angle panel that eliminates color shift on your screen no matter where and how you look at it. The exclusive Splendid Video Intelligence Technology optimizes video performance and image fidelity by enhancing color, brightness, contrast, and sharpness. 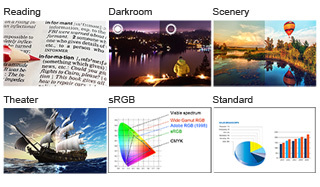 Featuring two new modes - Reading and Darkroom - in addition to the Scenery, Standard, Theater, and sRGB modes. Low-blue Light technologies also reduce the strain on your eyes after long-time usage.